The Problem Analysis phase allows individual perspectives to be explored in participatory activities such as workshops, or on-line interactions to facilitate mutual learning and the development of a shared vision of the problem. 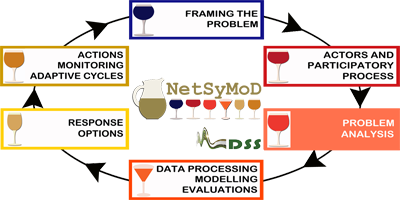 Probelm analysis is also crucial to frame and orient the design of subsequent activities: data processing, modelling and evaluation procedures to be possibly supported by DSS tools. Creative System Modelling Workshops (CSM) here support participatory modelling in which cognitive mapping (CM) techniques are used to design and later on develop formal dynamic models aimed at the analysis of the socio-ecosystem considered in the specific case, with the contribution of the involved actors. CSM provides not only a common ground for the mutual understanding among the parties involved, but also a sound basis for the development or tailoring of Decision Support System (DSS) tools and for easier communication with the general public. Cognitive maps can evolve into more structured and formalised means such as Causal Loop Diagrams and Stock&Flow Relational Diagrams, and eventually into the final formalisation step by means of simulation modelling tools, possibly integrated within a single Integrated Assessment Model. Loose or full coupling of modelling outcomes are then implemented within the DSS tool. An alternative to the workshop is the engagement of different actors through online discussion that can enable knowledge sharing and mutual understanding, and their involvement through online surveying for providing understanding of individual perspectives that can serve for tailoring of the DSS. Exploration of plausible future scenarios, on the basis of previously developed reference storylines (e.g. the climate change scenarios developed by the Intergovernmental Panel for Climate Change at the global level) is also of great potential in these phases, because it allows for defining possible boundary conditions which could determine the effectiveness and the robustness of current decisions. The main outputs of the Problem Analysis Phase are: (i) shared definition and cognitive model of the problem at hand and of the socio-ecosystem to be analysed; (ii) lists of the main criteria to be considered for the decision; (iii) relevant value systems; and (iv) preliminary elicitation of systems of preferences of the main stakeholders.